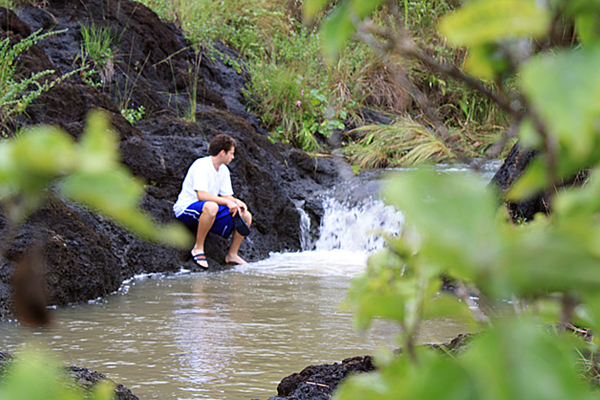 Tucked and hidden in the hillsides of Merizo are pristine natural pools consisting of several pockets of refreshing cool waters filled by streams cascading down dark lava-rock formations. The pools are part of the Pigua River. The main pool is large enough for a group of people to take a leisurely dip in, and deep enough for jumping into from the ledge above. Duration: (1 hour) 5-10 minutes to pools. Take time to swim, jump in and enjoy the view. Driving Directions: Head southbound from the Cross-Island road intersection. Continue on the coastal route 4 through the Talofofo and Inarajan villages. Enter the Merizo village and turn right when you approach the Santa Marian Kamelen shrine/park on the left side of the street, onto the road where the San Dimas Church and Malesso Kombento are located. Continue uphill towards the housing area, then take the second left turn into Mansapit Lane and drive in, until you reach a dead end, where there is a parking lot. Look for the Priest’s Pools sign which indicates the direction of the trail heading towards the grassy hillsides. A trail veering to the left will lead you to some rock formations where you can see a panoramic view of the ocean. Keep on the trail that winds along the bottom of a hill, and continue on the gradually descending path. Shortly after, you will hear the sound of rushing water, indicating you have reached the main pool. Best Time To Go: Since the hike is a short distance, arriving at the pools in the mid-afternoon hours will give you ample time to enjoy the cool waters under the milder afternoon sunlight. The mouth of the first cave starts out no larger than a crawlspace and opens up to a two-story cavern. Bring flashlights, or a helmet with built-in light to go on a spelunking tour through the cave’s short but interesting network (tunnels). 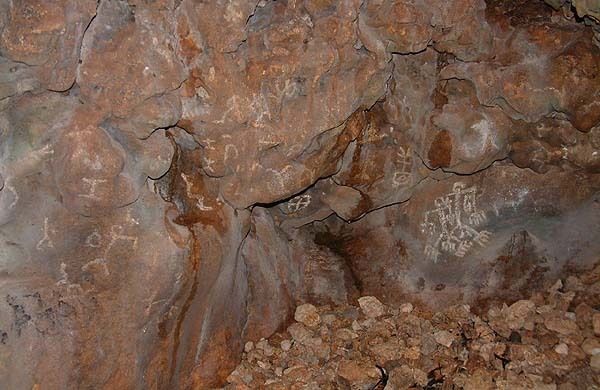 The second cave is where you can view petroglyphs used by ancient Chamorus to teach about celestial navigation. The third cave is the largest and has a sharp drop of about 30 feet or more behind boulders that border the mouth. 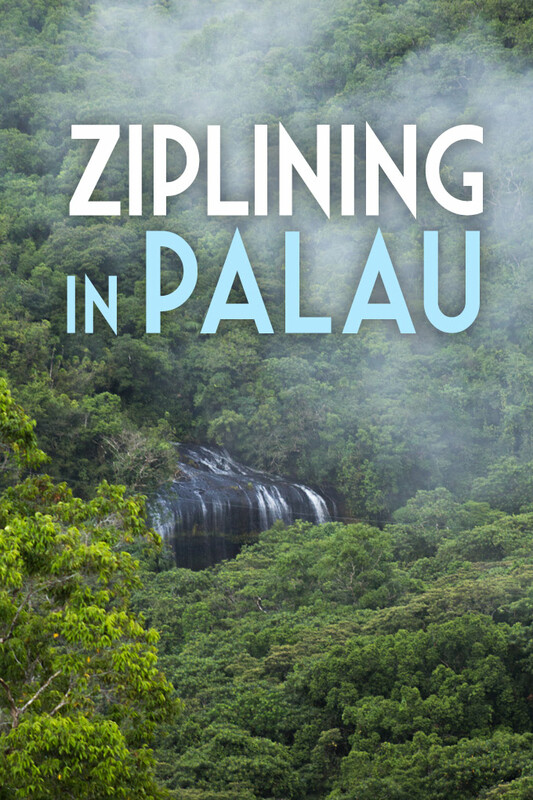 At the backside of the cave, there is a long and thick rope used for repelling to the bottom. Driving Directions: Head southbound from the Cross-Island Road intersection. Continue on the coastal route 4 through Ipan Talofofo. Stop at the intersection at the top of the hill going to Talofofo village, and down to Talofofo Bay. A lookout point should be on the left. Turn right towards Route 4a, to Talofofo village, and look for the sign that says Talofofo Caves almost immediately to your right. Park your car along the entrance of the trail, by the side of the road. Follow the beaten trail and look out for fluorescent ribbons on trees that will direct you to the path of the caves. First and second caves are on the left side of the trail. While the third cave is on the right side. Remain silent or talk quietly inside the caves. Using protective headwear is recommended for safety. Divide groups into two or three depending on size when entering, so that there will be ample walking space inside caves. Keep hands free and cast light on where you will be stepping to ensure steady footing. Stalagmites forming on the bottom make the terrain bumpy and uneven. Do not repel down the rope if you do not have experience and extra climbing equipment. If it is difficult going down, it will take twice the effort going back up. Best Time To Go: Anytime of the day since the trees provide complete coverage throughout the trails. The small cave overlooking the ocean, feeding into Inarajan Bay, houses the famous petroglyphs depicting a male and female human figure. 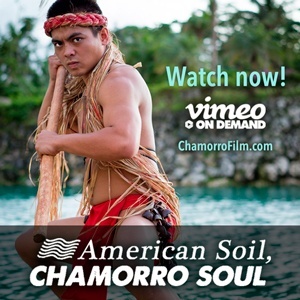 These drawings have inspired countless local entities into using the distinct symbol to promote the Chamoru culture in souvenir items from stickers, t-shirts, environmental posters to company logos. 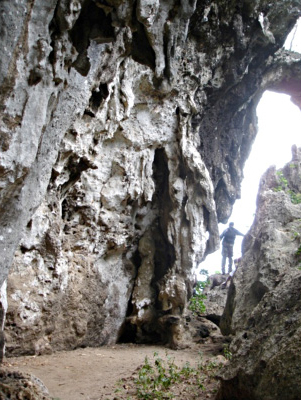 The cave was named after Gadao, the ancient Chamoru Chief of Inarajan village. Driving Directions: Head southbound from the Cross-Island road intersection. Continue taking the coastal route 4 to Inarajan, and right before the first bay, there is a road on the left with a ‘Historical Site’ sign. Take that left turn in and you will be driving a long narrow road, right alongside the bay shoreline. Take a right turn on the first gravel road and drive in until you see wire cables on your right, fencing an area. Park your car on the side. The wire cables mark the entrance of the trail. Pass under the cable. Walk towards the beach and stay right. After passing through some bushes you will be facing a rock cliff. Follow the edge of the rock cliff. You may be able to see red dirt stains on the rocks where other hikers have treaded making a trail to the cave. You can walk along the rocky cliff-side where a naturally grooved path has been etched. A small opening will appear on the next rock formation to the left of you. That is the mouth of the cave. The wall on the left, facing the mouth of the cave as you walk in, is where the petrogylphs are found. Best Time To Go: Anytime of the day when it is sunny. Rainy weather will make the rock-path extremely slippery and hard to get a firm grip. This long stretch of powdery white sands offers a more peaceful and serene experience if you’re looking for a relaxing day on the beach than the usual bustle in Tumon beaches teeming with tourists and locals. 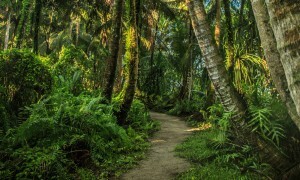 Although most of the property fronting the beach is private, there are many areas where lush trees and their branches jut out over the sand to provide shade. There is a nice shady cove at the end of the beach trail. Once you reach the end, it is hard to resist the urge to take a stroll in knee to waist-deep water beside the limestone cliffs that lead to the bottom of Two Lover’s Point. In the summer months you may encounter one of the limestone rock-walls crawling with hundreds of large hermit crabs, shell-to-shell like it was bumper-to-bumper rush-hour traffic. The eerie clattering sounds, made by crabs skittering across the rocks, can be heard from a distance. If you plan on snorkeling, you may be amazed at the abundance of baby giant clams wedged between the corals displaying their vibrant colors. 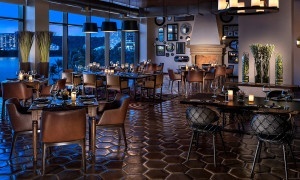 Duration: (3 hours) 20 minutes to the cove, 30 minutes to the bottom of Two Lover’s Point. More time for snorkeling, tanning or beach-combing. Driving Directions: Head northbound on Pale San Vitores Road in Tumon and proceed straight forward at the intersection across Westin Hotel to Gun Beach Road. Drive until the end of the road. You may turn onto the sand gravel parking area or you may park at the Beach Bar parking lot. Head towards the headland that separates the two beaches. Beside the site of a Japanese WWII gun are a flight of stairs that lead into a cliff-side trail. Stay on the length of the beach that will lead you to the cove. Steer clear of areas with posted private property signs. The cove is the area where the sandy beach ends and where tall limestone cliffs begin and meet the rolling incoming waist deep waves. Best Time To Go: Check for the tide schedule and go two hours before high tide, when currents are not as strong. However, any time during the day is fine since there is plenty of shade to find when you need to cool off. Deep in one of the valleys of Inarajan, lies a little oasis where families have come to enjoy the waterfalls that spill into a pond. A rope hangs from a tree for those who love making a splash into the water. The short leisure trail takes a sudden dip and some scaling on rocks is involved. The trail is a short distance, but it is steep, which requires you to hold on to trees and rocks as you descend down a thickly vegetated ravine. Duration: (2 hours) 10 minutes to the falls. Consider taking some time for swimming. Driving Directions: Head southbound from the Cross-Island Road intersection. Continue taking the coastal route 4 to Inarajan. As the road begins to slope, be on the lookout for the Inarajan village billboard sign at the top of a winding road. That is where you will turn off from the road and park. Follow the trail towards the valley that can be seen as you continue down the trail. The slope will end at a ledge. Have someone who is able to assist others, carefully scale the rocks, first. Before putting weight or firmly gripping a rock, test for stability. Scaling the rocks is a short distance but it is a steep downward climb. Rely on sturdy trees to help make your way down. Avoid stepping on wet slippery rocks as you walk along the river that leads into the pond. 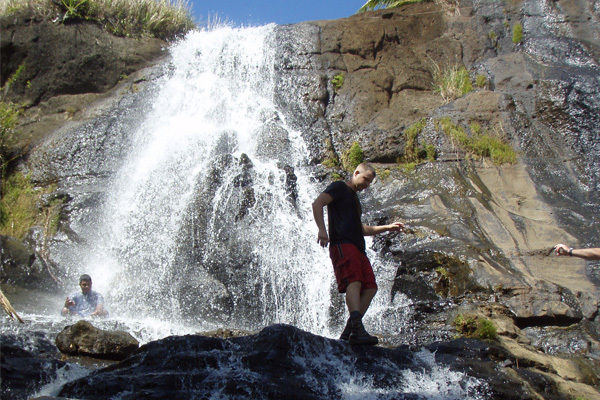 Best Time To Go: During rainy season, the waterfalls will be stronger, and there will be several little pools to dip in. See all these hikes on Google maps! 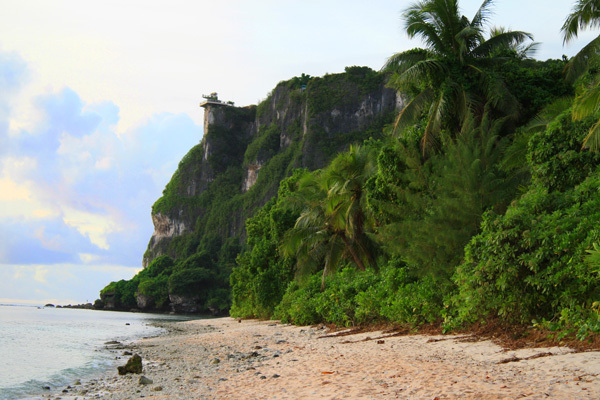 What’s your favorite family friendly hike on Guam?